Suburban Rainware System components are designed, manufactured and custom installed to effectively channel the water running off your roof. That’s important to maintain the appearance of your home and the landscaping, decking and concrete around it. Suburban Construction offers only the finest quality Gutter System materials, custom installed to insure the proper run off of rain and melting snow. 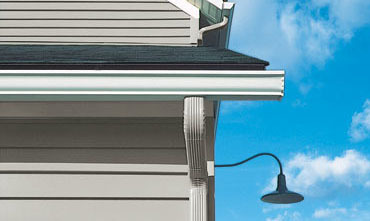 Suburban rainwear systems include gutters, elbows, downspouts, miters, and other accessories. Gutters are fabricated on site by your installer from color-matched gutter coil to give you a complete system. Paula Sands of KWQC News Channel 6 did a report on how the Gutters are installed. Please enter the number 17576 in the box provided below.